Since the inauguration of Bolivia’s president Evo Morales in 2006, the new government is dedicated to free the country from the deep and continuing processes of poverty and inequality. With its new political push for a decolonised and more socially just education system and society, including the new ‘decolonising education reform’, Bolivia is marking an alternative route towards development; a route that stands in stark contrast to mainstream neoliberal inspired global tendencies. Education provides an important entry point in to understanding processes of transformation in contemporary Bolivia, especially since teachers are regarded by the Bolivian government as important agents of change. The new Bolivia-owned and ‘revolutionary’ education reform for decolonising education prioritises future teachers’ pre-service training in Bolivia’s ‘Normales’ – or teacher education institutes. This book illustrates the challenges and opportunities of the envisioned transformation of the Normales, and demonstrates a range of structural obstacles as well as the emerging potential niches for change. By locating Bolivian teacher education – and Bolivian future teachers – in a broader (inter)national socio-political, economical and cultural context, this research explores how Bolivian pre-service teacher education institutes and actors develop strategies for, or against, the societal transformation that is envisaged by the new Bolivian Plurinational constitutional regime. For a summary (in English, Dutch and Spanish) please click here. Los resultados del estudio fueron publicados en 2012 en Español con el Programa de Investigaciones Estratégicas de Bolivia (PIEB), en La Paz. Aquí se puede obtener el PDF del libro, que también está en venta en las librerías en Bolivia. Aqui se puede leer: el resumen del estudio. B. Lozada Pereira (2013), Recensión Biblográfica del libro Los Futuros Maestros y el Cambio Social en Bolivia de M.T.A. Lopes Cardozo, 2012. In: Estudios Bolivianos N° 18, Instituto de Estudios Bolivianos, Universidad Mayor de San Andrés, La Paz, Bolivia, pp. 213-219. Nueva Crónica y Buen Gobierno (2013), Recensión del libro Los Futuros Maestros y el Cambio Social en Bolivia de M.T.A. Lopes Cardozo, 2012.
of coloniality and continuation? Education Policy Analysis Archives, 23(4). Lopes Cardozo, M.T.A. (2013). A Critical Theoretical Perspective on Education and Social Change in Bolivia: A Contested Alternative Pedagogy. Chapter 5 in: S.C. Motta and M. Cole (Eds. ), Education and Social Change in Latin America, New York, Palgrave Macmillan, pp. 89-106. Lopes Cardozo, M.T.A., & Strauss, J. (2013). 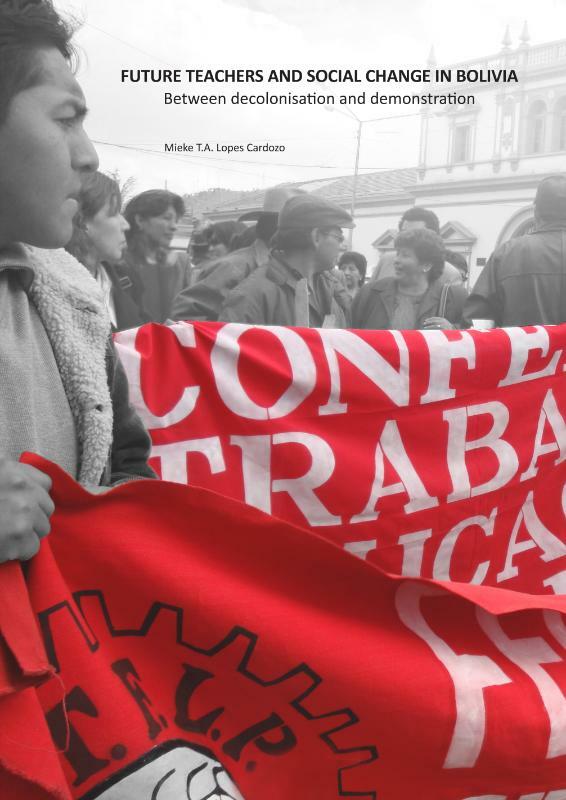 ‘From the Local to the Regional and Back: Bolivia’s Politics of Decolonizing Education in the Context of the ALBA–TCP’, chapter 12 in: T. Muhr (ed), Counter-Globalization and Socialism in the 21st Century: The Bolivarian Alliance for the Peoples of Our America, London, Routledge, pp. 203-218. Lopes Cardozo, M.T.A. (2012). Decolonising Bolivian education: Ideology versus reality, in: T. G. Griffiths and Z. Millei (eds), Logics of Socialist Education: Engaging with Crisis, Insecurity and Uncertainty. Dordrecht: Springer. Lopes Cardozo, M.T.A. (2012). ‘Turbulence in Bolivia’s Normales: Teacher education as a socio-political battle field’. Propects – Quarterly Review of Comparative Education, Online publication November 2012, journal publication March 2013. Lopes Cardozo, M.T.A. (2012). Los futuros maestros y el cambio social en Bolivia – Entre la descolonización y las movilizaciones, PIEB (Programa de Investigación Estratégica en Bolivia) & Universiteit van Amsterdam, La Paz. Lopes Cardozo, M.T.A. (2012). Transforming pre-service teacher education in Bolivia: from indigenous denial to decolonisation?’. Compare, Special issue edited by S. Aikman, 42(5), pp. 751-772. Lopes Cardozo, M.T.A. (2009). Teachers in a Bolivian context of conflict: potential actors for or against change?, special issue on ‘New perspectives: Globalisation, Education and Violent Conflict’, Globalisation, Societies & Education, 7 (4), pp. 409-432 (a version of this article is also available under ‘Publications’ on this blog). Lopes Cardozo, M.T.A., & Sawyer, J. (2014). Exploring the role of teachers as agents of change in creating gender equal classrooms in Bolivia. Conference paper presented at the Societies for Latin American Studies (SLAS) Conference, University of London, April 2014. Lopes Cardozo, M.T.A. (2013), Bolivian teachers’ limited agency in a potentially enabling context: soldiers of liberation or guards of coloniality and continuation?, Presented April 27-May 1 2013: American Educational Research Association, San Fransisco, USA. Turbulence in Bolivia’s normales: Teacher education as a socio-political battlefield. Mieke Lopes Cardozo. Periodico Digital PIEB (2012) Los Futuros Maestros y el Cambio Social, en la FIL [Feria International de los Libros] de La Paz, 31-07-2012, click here. Radio interview Aymara radio station, El Alto, 29-07-2012, with Lic. Juan Huanapaco Quino. PIEB publicaciones (2012) Investigación mira a los futuros maestros y el cambio social, 03-08-2012, click hereand here. Info-Bolivia.com (2012) , La formacion de los futuros maestros y maestras en Bolivia, tema de un coloquio, August 2012 click here. FMBolivia.tv (2012) La formacion de los futuros maestros y maestras en Bolivia, tema de un coloquio, August 2012, click here.